Our third day on the Kiel Canal was the longest and the most exciting. 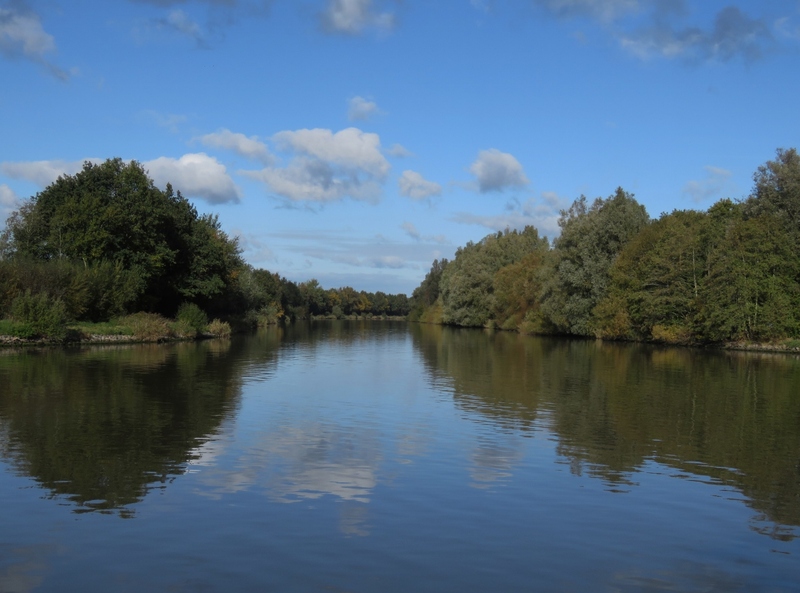 After an aborted first attempt due to fog and traffic movement restrictions in the canal, we made a 36-mile run from Rendsburg to Brunsbuttel at the western canal entrance. 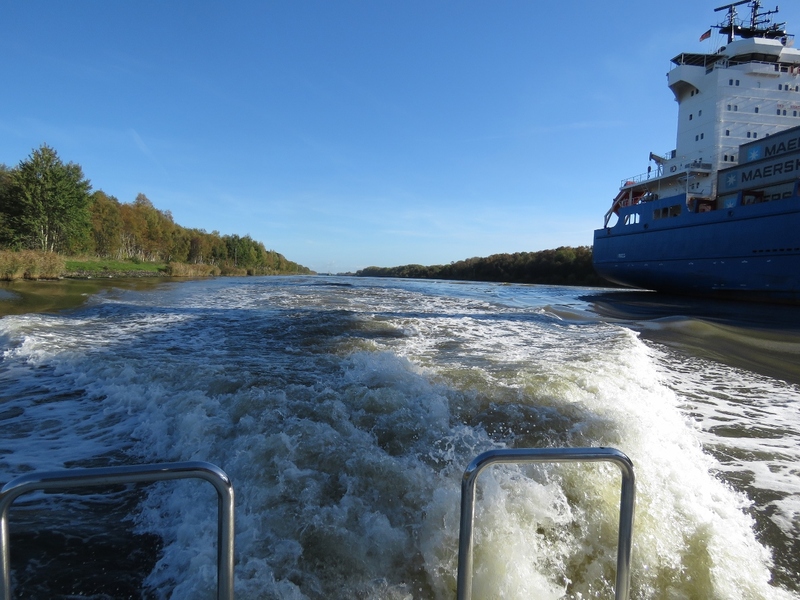 During the transit, we ran at wide-open-throttle for a time in order to pass a slightly-slower 528ft (161m) ship, whose bow wake generated a 2-knot negative current in the confined canal waters. 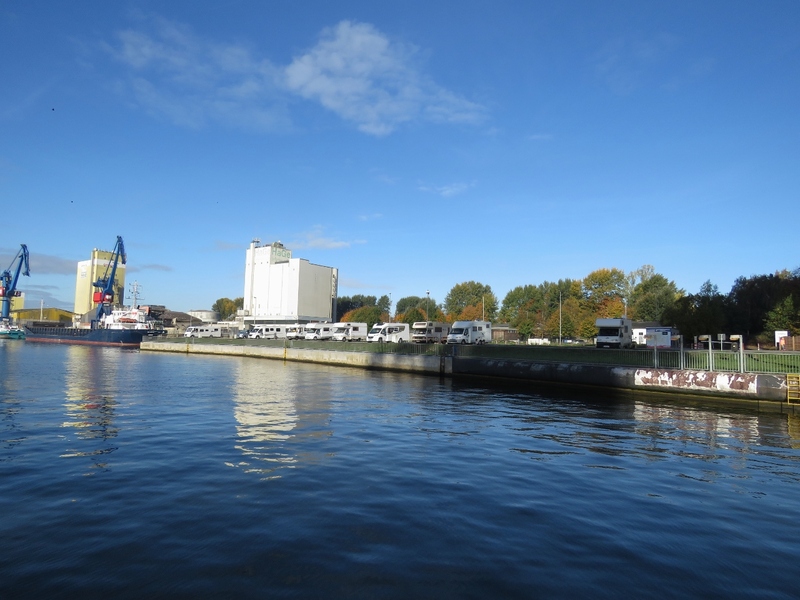 Our berth for the night in Brunsbuttel was adjacent to the sea lock entry—we could almost reach out and touch the passing ships. 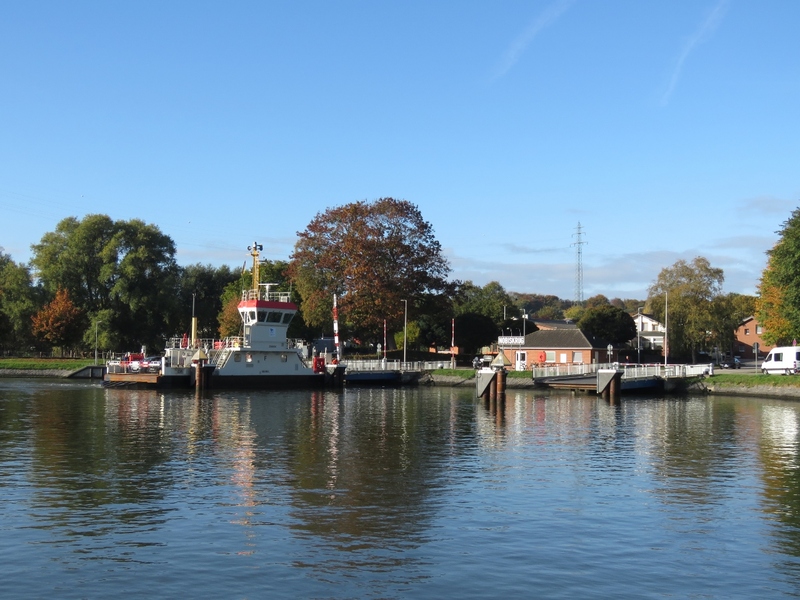 While there, we visited the Atrium Museum at the Locks and spent ages watching ships pass, both from Dirona and the lock observation decks. 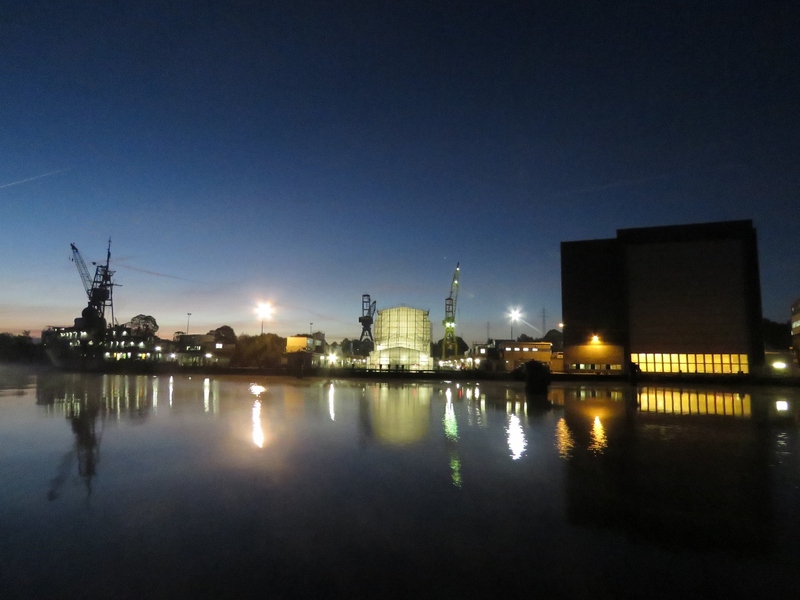 Passing the Nobiskrug superyacht yard shortly past dawn at 7am. Recreational craft are only allowed on the canal during prescribed daylight hours which at this time of year are between 7am and 7:30pm. Recreational craft cannot be underway on the canal in poor visibility. 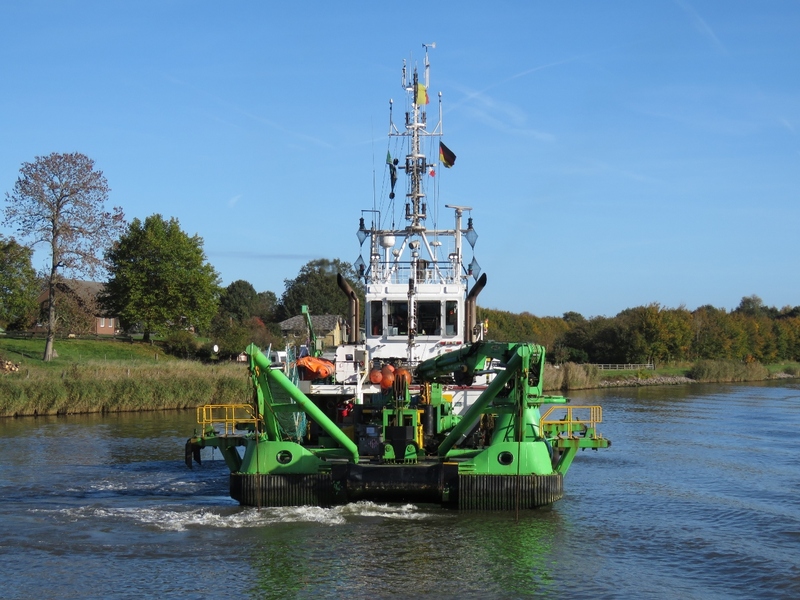 As we were about to enter the waterway, the Kiel Canal authority ordered us by radio to not proceed and return to Lake Obereider due to poor visibility farther west. 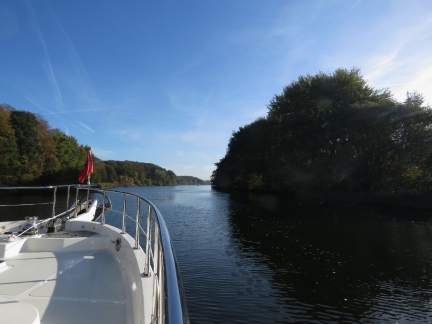 As you can see, the visibility is quite good here, but the canal is predictably non-negotiable, so we’ll need to wait until they believe it is safe for recreational craft. Three and a half hours after we first got underway, we’ve been given permission to proceed. 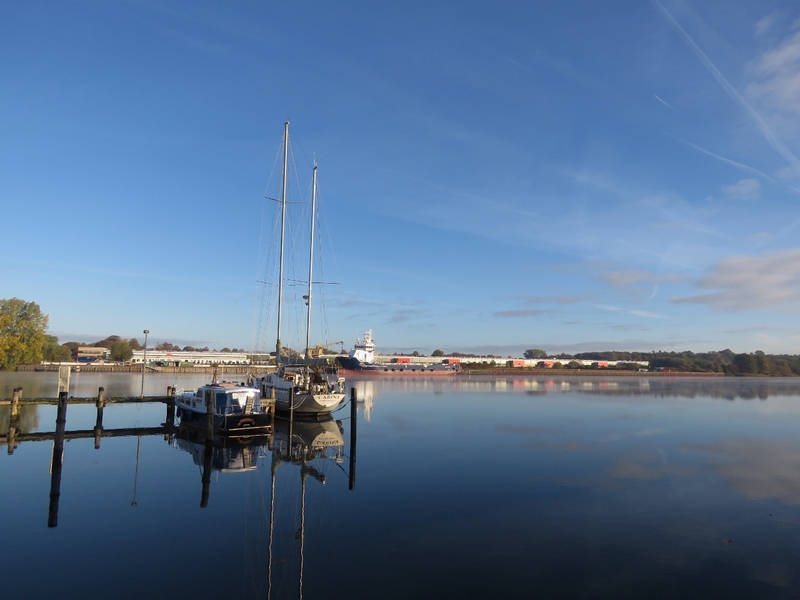 Another view to the Lurssen yard as we enter the Kiel Canal. The Nobiskrug Ferry arriving at the north shore. 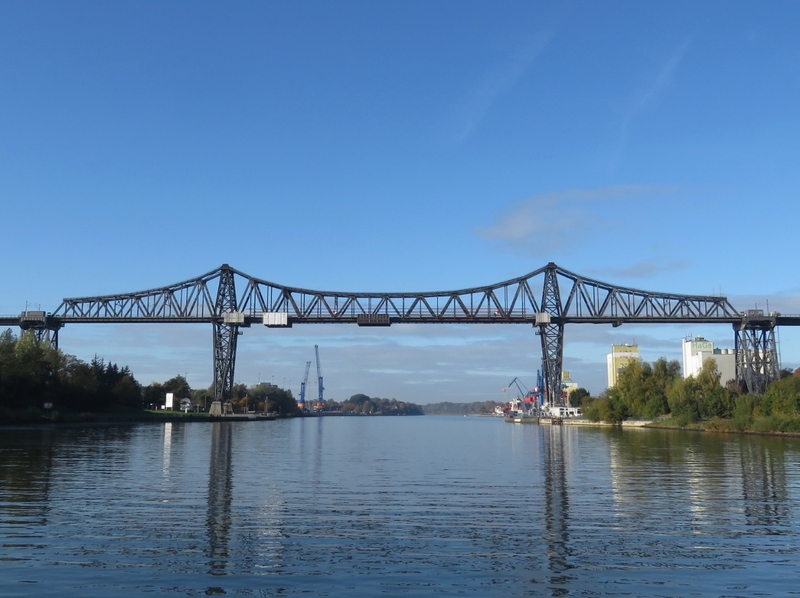 Approaching the Rendsburg High Bridge. 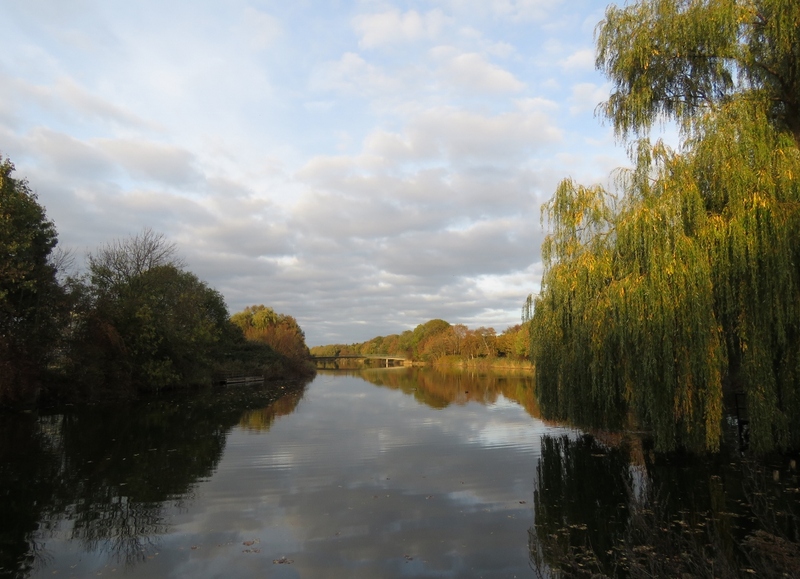 One of several RV parks alongside the canal. 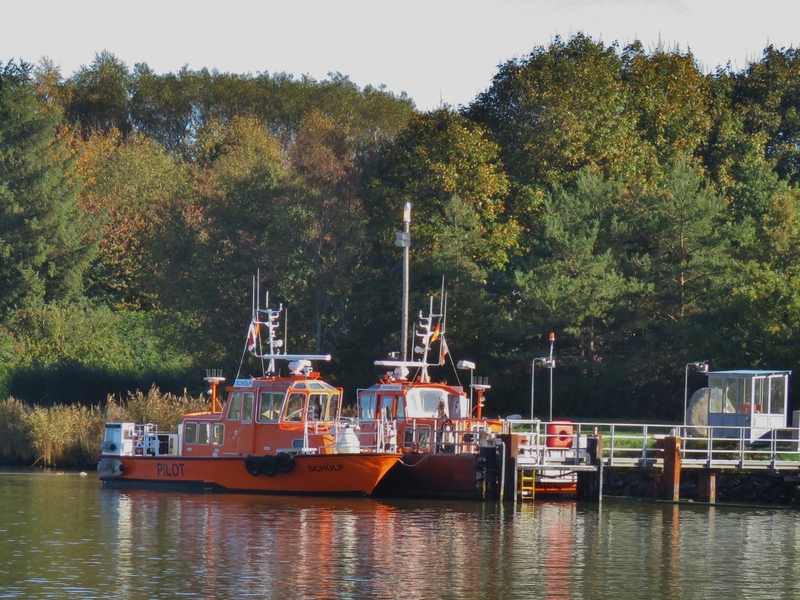 The pilot boats Schulp and Rusterbergen moored near Rendsburg. 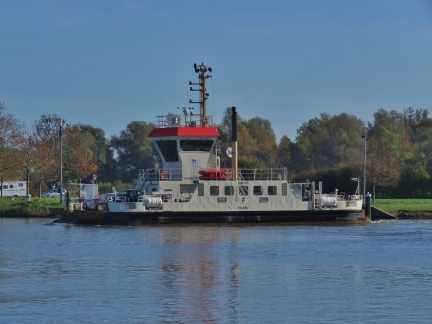 The Breiholz Ferry departing the south shore. The dredger Dhamra working the south side of the canal. The 528ft (161m) container ship Suderoog is running at 7kts, and we’re passing on the right at 8 kts. It feels remarkably close. 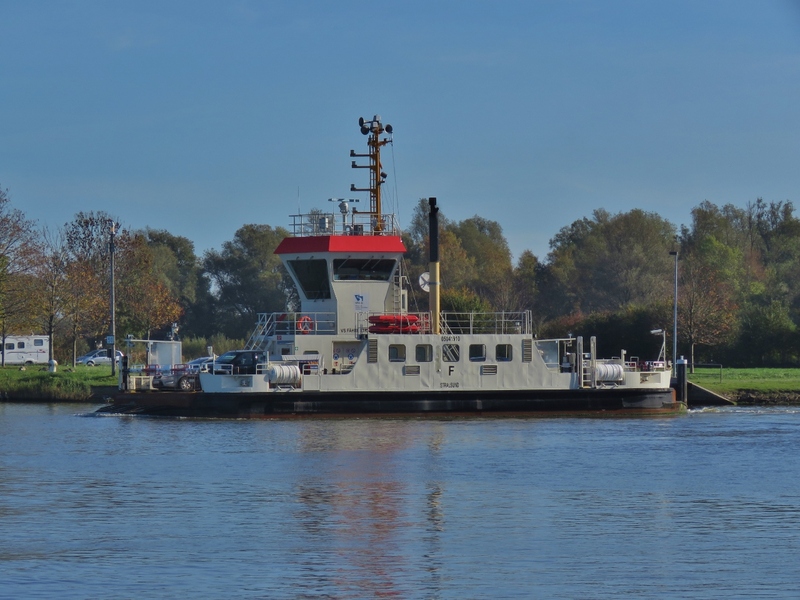 The Suderoog is running at 7kts, we’re running at 8kts, and to pass we increased to wide-open-throttle to minimize the time we spent beside the big boat. Wide-open-throttle should have us at 9.5kts, but a super-interesting effect becomes apparent as we approach the bow of the Suderoog. Because the ship takes such a big percentage of the overall area of the canal, the water rushing past from its bow to its stern is suprisingly powerful as we near the bow of the boat and we could actually only make 7.3 kts. 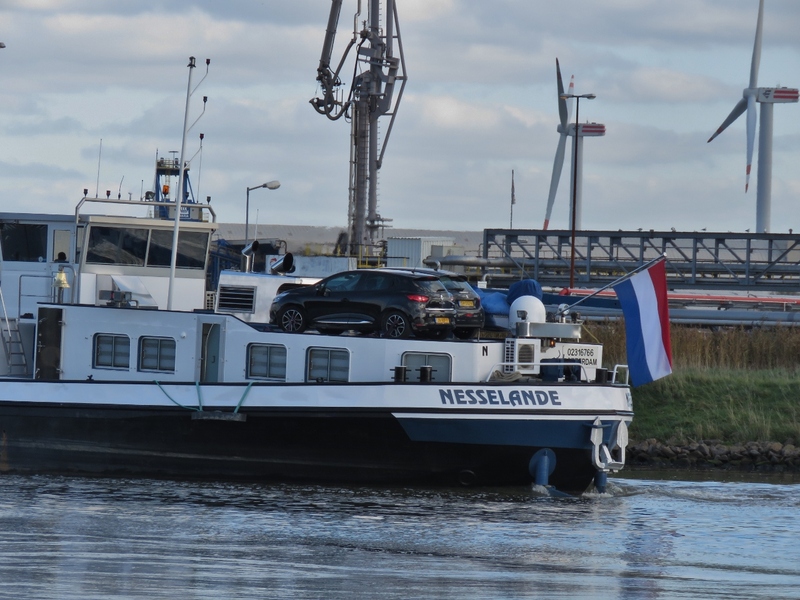 Ironically, at 2.5kts faster through the water than the Suderoog is travelling, we only barely have the speed to pass in the high-speed current. This is another reason we’re glad to have upgraded our main engine from the then-standard 163HP Lugger to the 266HP Deere. 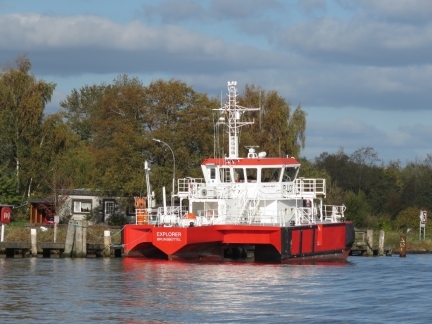 With the lower-powered engine we’d be in the ironic position of being 1 knot faster than the Suderoog and yet 1.5 kts too slow to be able to pass. 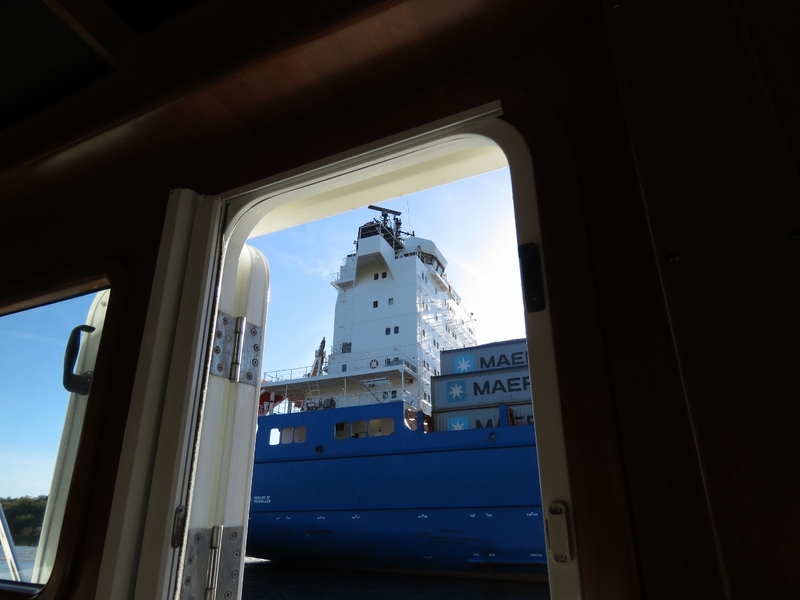 About as close to we’ll get to a rooster tail behind our Nordhavn. Here we’re doing 9.5 knots through the water, but actually only making 7.3 knots over ground working through the bow wave of the Suderoog. The entry to the 1.8mi (2.9 km) Gieselau Canal, linking the Kiel Canal with the River Eider. 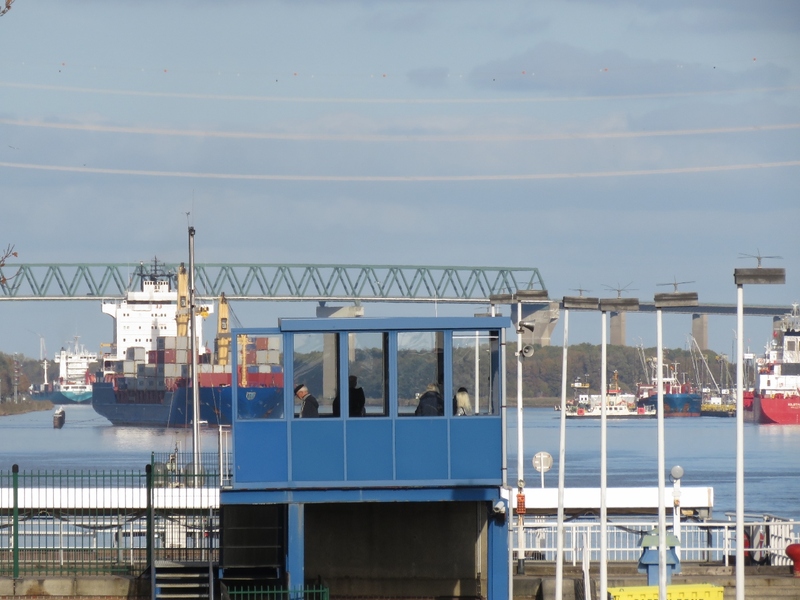 The 503ft (153.4m) Ro-Ro/container carrier Friedrich Russ (rightmost) pulled off on a siding with the 295-ft (90m) cargo ship Spanaco Simplicity. Commercial ships are placed into groups by dimension and the siding signals indicate which groups must pull over to allow vessels to pass within the siding. We’re permitted to exit the siding, but the commercial vessels have to wait. 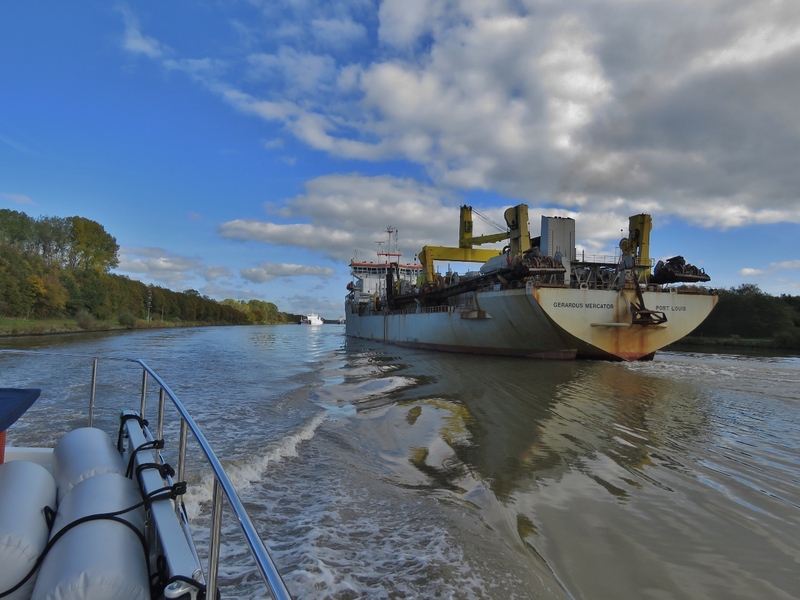 Passing the 501ft (153m) hopper/dredger Gerardus Mercator with the Ro-Ro/container carrier Friedrich Russ visible in the distance waiting so the ships can pass within the siding. 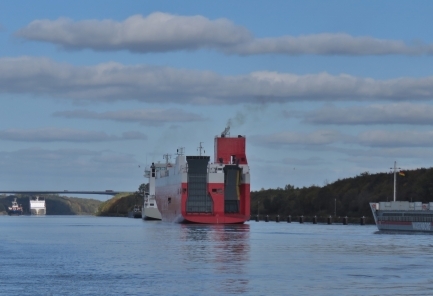 The 485ft (148m) vehicle carrier Seine Highway following behind Gerardus Mercator with the 360ft (110m) general cargo ship Maasborg bringing up the rear. They are pulled over to the right to allow room to pass the oncoming Friedrich Russ and Spanaco Simplicity within the siding area. 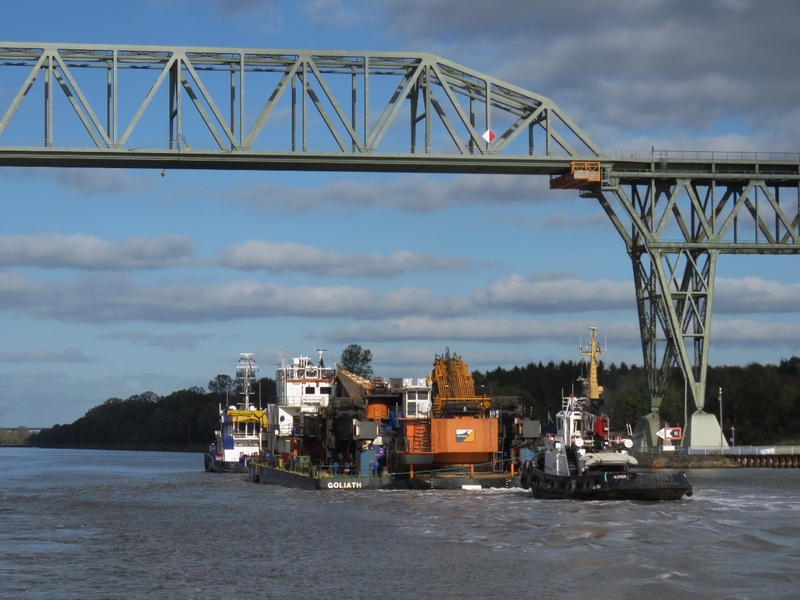 The tugs Dutch Pearl and Rostock guiding the barge Goliath under the Hochdonn railway bridge. 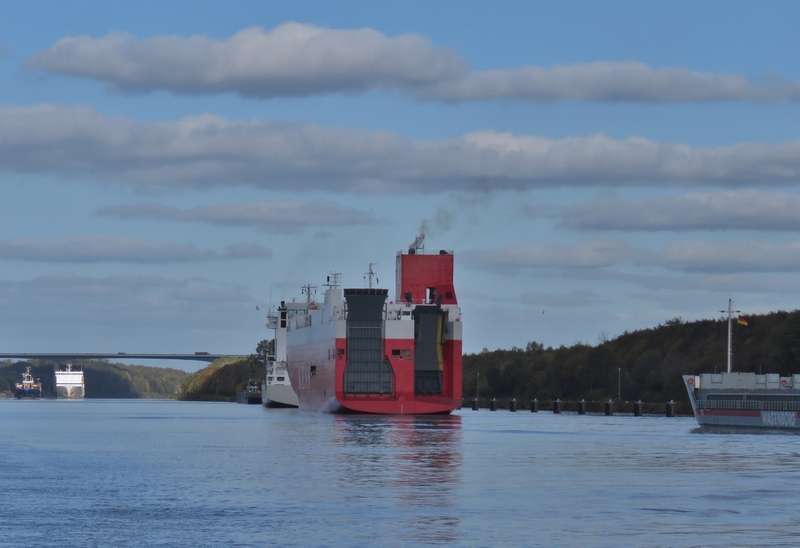 Three more large oncoming ships on the Kiel Canal. 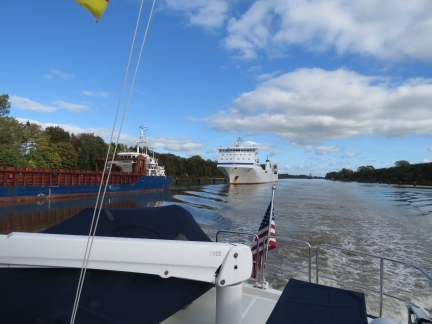 Here you can see the smaller commercial vessel on the right is permitted to proceed and so is passing the larger vessel who is prohibited from proceeding until the oncoming traffic clears. There’s still rooom for us to slip by on the right. 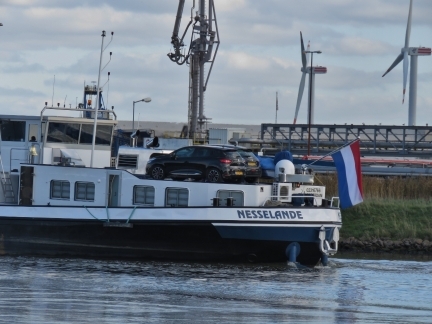 The barge Nesselande carrying two car “tenders”. Hanse 1 is among the smallest pilot boat we’ve ever seen. 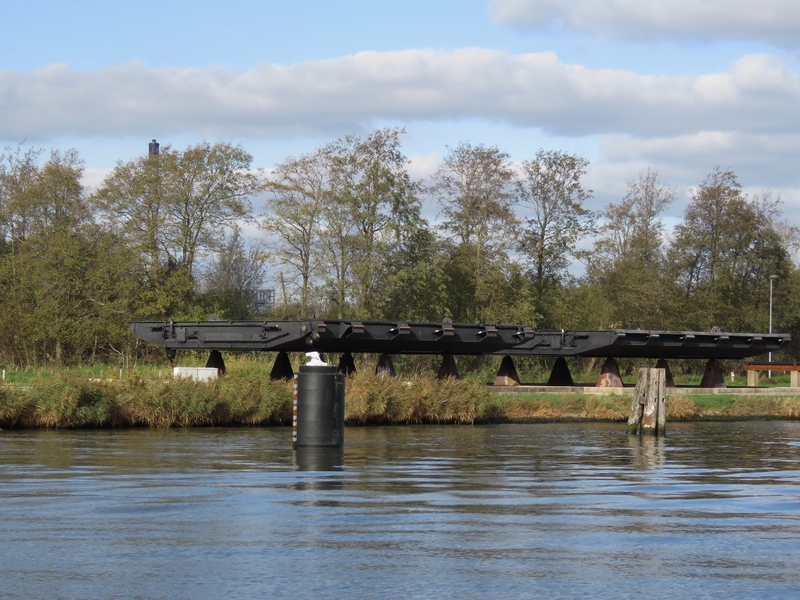 Lock gates mounted ashore north of Brunsbuttel. The pilot boat Explorer moored off the Brunsbuttel inner harbour. 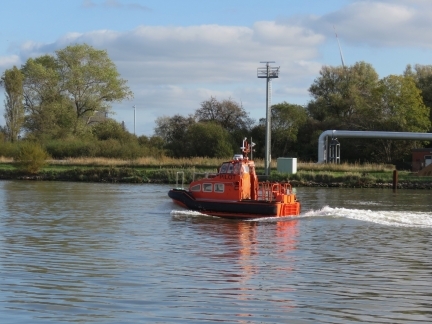 The SWASH (Small Waterplane Area Single Hull) vessel has a torpedo-shaped float at center containing the engines and two outriggers for stability. The Seimens-powered vessel is the first hybrid pilot boat in the world, with an electric hybrid motor in addition to the drive motor and auxiliary diesel motor. Another lock door, perhaps for the new Brunsbuttel lock currently under construction. The recreational craft moorage at Brunsbuttel is adjacent to the lock entries. Shortly after we’d tied off, this was our view out the pilot house door of Symphony Star entering the locks. Wow, what an awesome place to be. 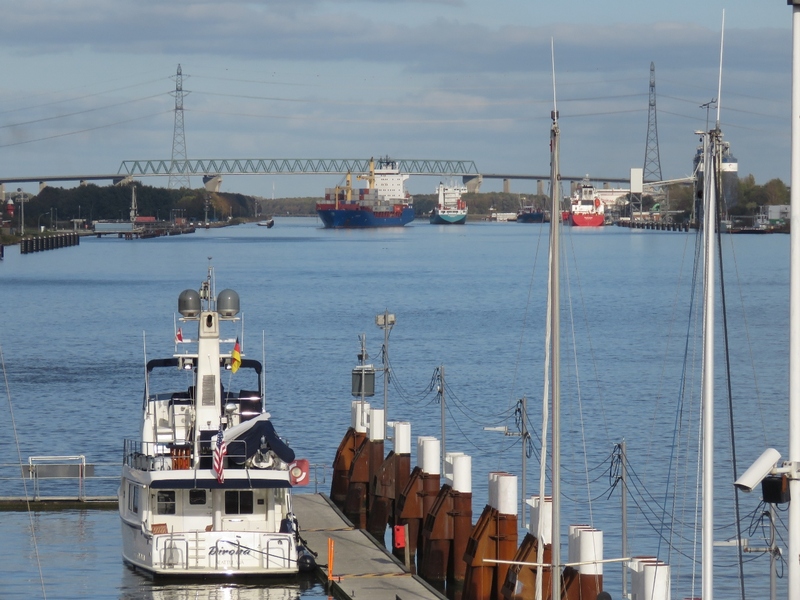 Looking across our moorage from the eastern viewing platform to ships approaching along the Kiel Canal. The large U-shaped harbour had power on the other pontoon, but not where we are. The advantage of our location is we can see right into the locks and watch ships enter and leave. 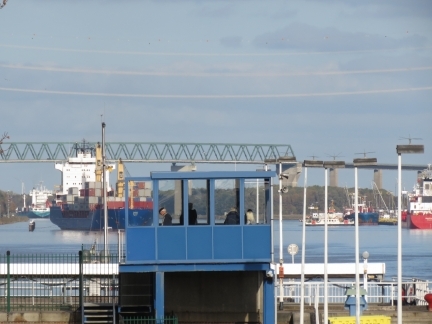 The eastern viewing platform over the Brunsbuttel locks seen from the western viewing platform. Dirona‘s grey domes are just visible at bottom left. 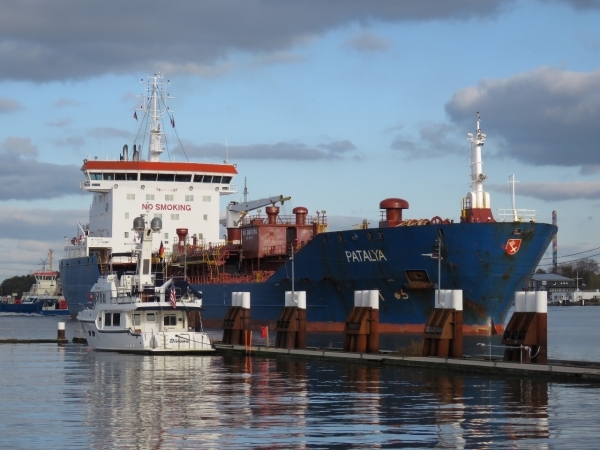 The 472ft (145m) oil/chemical tanker Patalya towering over Dirona as it approaches the Brunsbuttel locks. 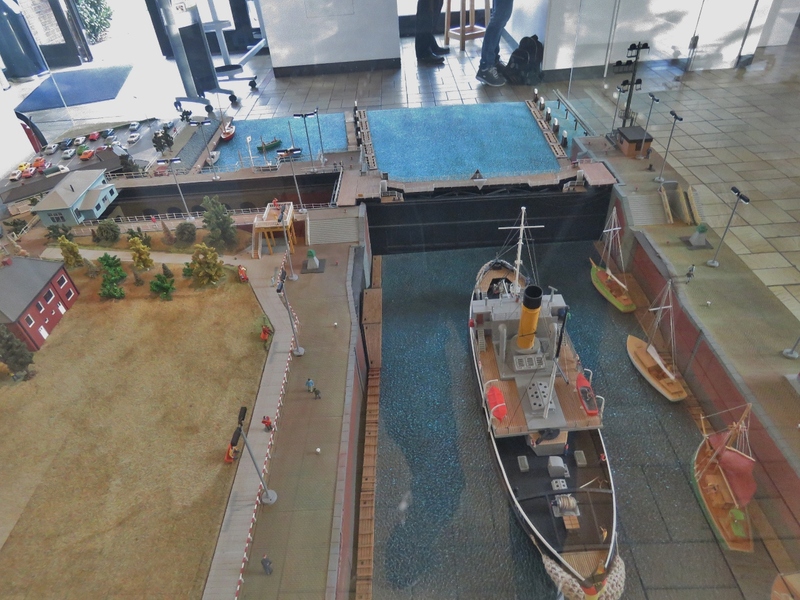 A model of the northernmost Brunsbuttel lock with the recreational craft moorage at top left at the Atrium museum at the Locks. The small museum was packed with excellent displays and models like this one, but everything was in German, so we couldn’t glean much on the details. 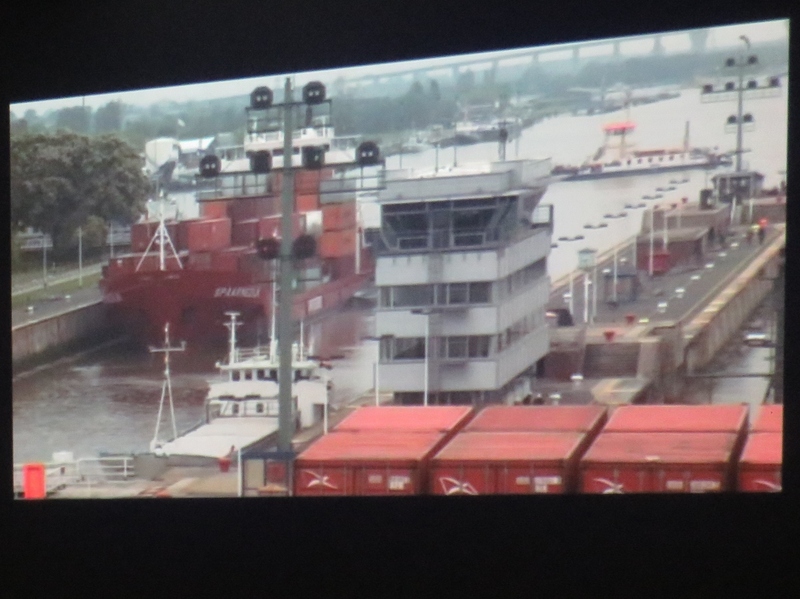 The museum at the locks had an excellent 10-minute video, available in English, that included great footage of large ships transiting the Kiel Canal. 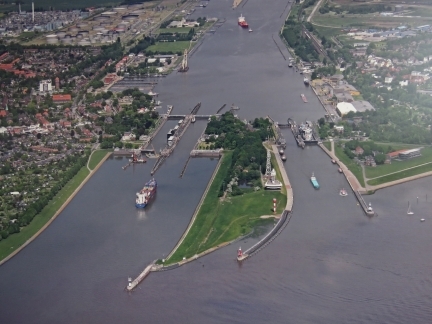 An aerial photograph of the Brunsbuttel locks showing the original locks on the right, completed in 1895, and the newer, larger locks completed in 1914. A fifth lock currently is under construction between the two sets. 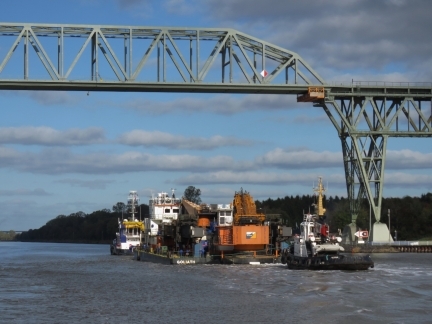 When this is complete, the two larger locks will be closed for renovations and upgrades. The Kiel Canal is one of the most travelled man-made shipping lanes worldwide. They’re very careful about safety, but there’s no escaping that large commercial vessels in close quarters carry risk, and there have been many problems over the years. The older locks at the Kiel-Holtenau end currently are closed for repairs after a ship rammed the gate. These photographs show two of the more major incidents at the Brunsbettel end. Looking north along the Braake in Brunsbuttel. The waterway was created by the break of the Elbe dike during the 1717 Christmas flood that killed over 10,000 people in Germany, Denmark and the Netherlands. 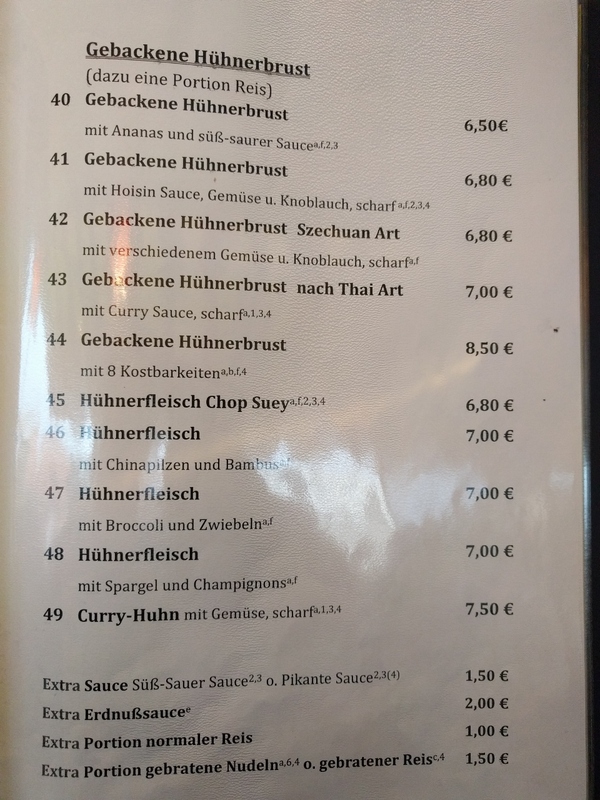 English is less prevalent in Germany than most places we’ve visited, but we’re usually able to get an English menu or get help translating from the server. 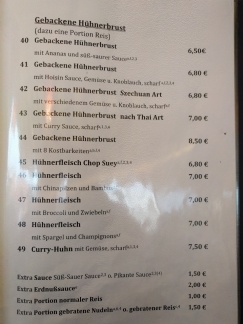 But the server at China Bistro Hoa Mai spoke no English and the German menu was pretty impenetrable. We were about to try Google translate when patrons at the next table offered to translate for us. We had a good meal. 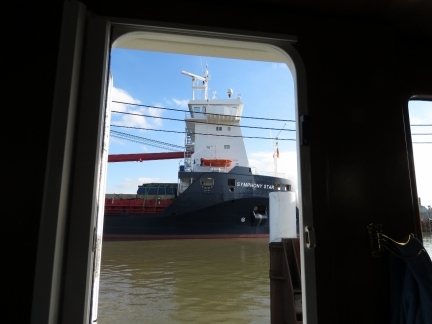 Suderdoog, the ship we were slow to pass earlier today, locking through at 7pm. 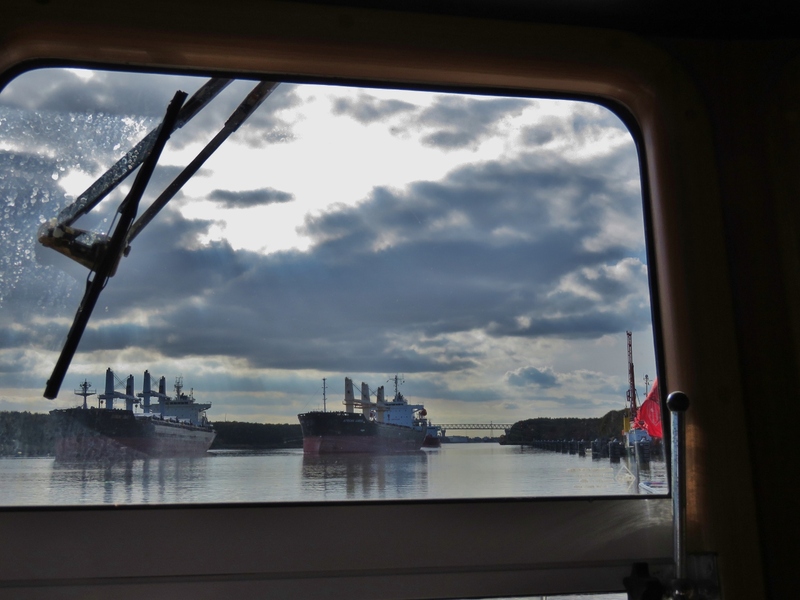 They were travelling only a knot slower than us, but larger ships have significant delays waiting for oncoming traffic that doesn’t slow us. 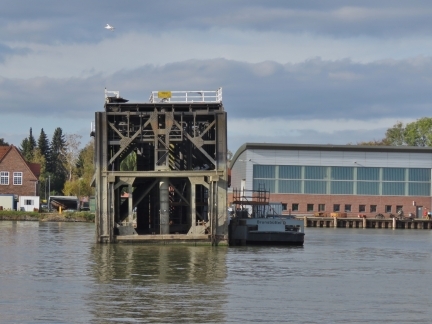 The lock door you have seen in Brunsbüttel is a spare part for the existing locks. 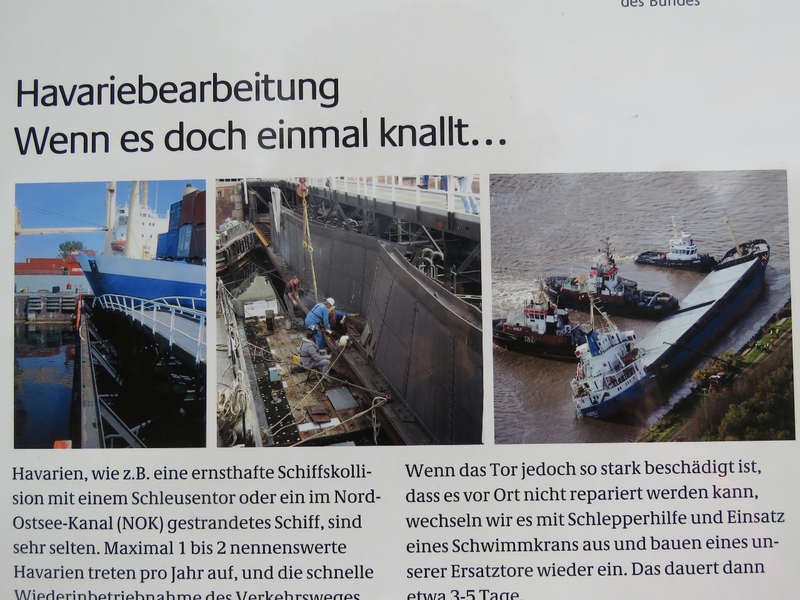 Love the description and photos of the Kiel Canal. It must be great fun to watch a nonstop array of huge and medium commercial vessels passing at close quarters. 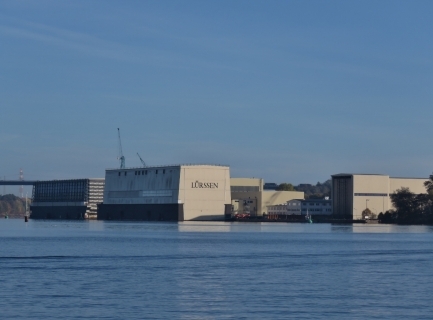 Too bad you didn’t see one of the astonishing megayachts built by Lurssen and Nobisrkug in the Canal. In fact, I’ve been surprised at the paucity of yachts in your recent cruising areas, although it is getting quite late in the season for yachting. 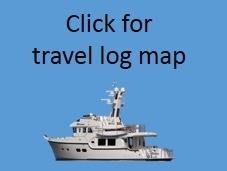 Most of the super yachts are usually heading for warmer climates later in the year so there are less around as winter sets in. 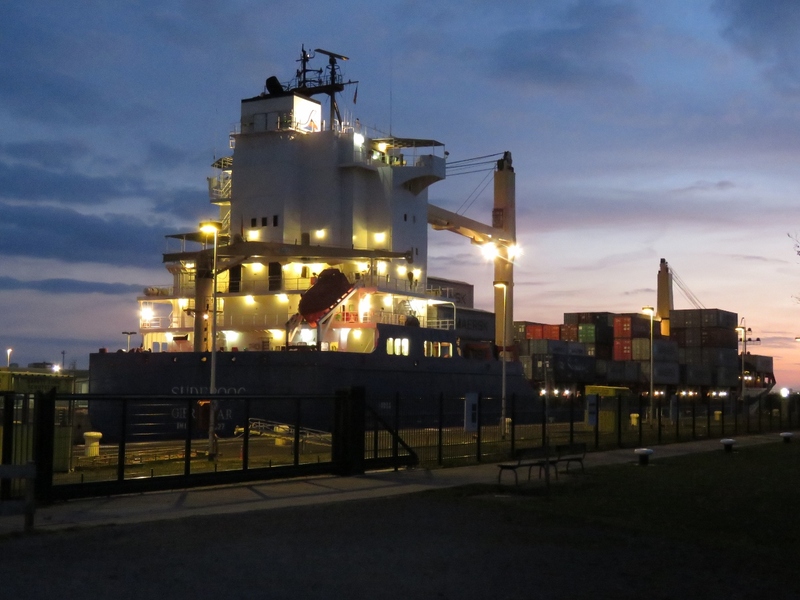 In many ways, we probably have more fun studying the larger commercial vessels but we’re interested in them all.